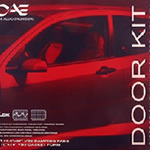 The DK-1 Door Kit includes (4) 13.5" x 37" sheets (13.88 sq.ft.) of VB-2 which is enough material to damp two average sized car doors. VB-2 is a highly moldable vinyl damping material that offers the DIY'er professional results. 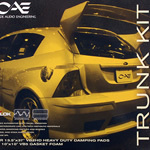 The TK-1 Trunk Kit provides (6) 12" x 30" sheets (15 sq.ft.) of high performance, lightweight V-MAX CLD damping material as well as a 10" x 10" sheet of VB-5 gasketing foam. VB-5 gasketing foam is commonly used to eliminate annoying squeaks, rattles and buzzes. VB-5 is a thin, neoprene product that may also be used to gasket and seal speakers airtight. © 2014 Cascade Audio Engineering, Inc., All rights reserved.